India hopeful that the Under-17 World Cup will inspire a generation of young players. Kushal Das,is confident India will stage a successful Under 17 World Cup. Kushal Das, the general secretary of the All India Football Federation (AIFF), says he is confident the first global football tournament to be held in the country will be a success. Das believes hosting the FIFA U-17 World Cup will be a “game changer” for the sport on and off the field. The official was responding to fears made by a number of individuals, including one of the nation’s favourite players, Baichung Bhutia, at India’s ability to host the tournament. Speaking at the recent Soccerex Global Convention in Manchester, Mr Das said: “I have read some of the comments made in regards to the [poor] condition of stadiums and training facilities but let me assure you that we are on track on delivering quality stadia as well as first class training pitches. “I am very confident the infrastructure will be in place and it will be to an internationally recognised standard, so everybody involved from the players and coaches to the fans and media will have a memorable time. It has been reported that FIFA has a potential $38 million investment in the pipeline for the tournament, which was awarded to India in 2013. The South Asian nation beat off competition from Ireland, Azerbaijan, Uzbekistan and South Africa to stage the finals. The 24 team competition is due to take place in August and September 2017. The six venues provisionally shortlisted are Kolkata, New Delhi, Kochi, Guwahati, Navi Mumbai and Goa. The German Nicolai Adam is coaching the Indian under-17 squad, who are likely to spend an increasing amount of their time in Europe in preparation for the tournament. The Indian football authorities are hopeful of reaching an agreement with the German counterparts that would allow the team to play in the country’s domestic youth leagues. Mr Das could not hide his disappointment at the results of the national team, whose slim chances of qualifying for Russia 2018 have all but ended after losing their first three qualification matches. However he said it was important to have a “long term” approach and pointed out other regional powerhouses who benefitted from “investing in their youth”. He added: “Counties like Japan and South Korea placed a great deal of emphasis on developing young players and now they are reaping the rewards of such policies. A number of players from those countries play their club football in major European leagues. This has also had a positive impact on their national teams, who can compete with the world’s best. Other panelists at the Soccerex Indian football forum included Peter Reid, who has been replaced by Nicolas Anelka as manager at Mumbai FC. The CEO of Northeast United FC, Rahul Patil was also present. 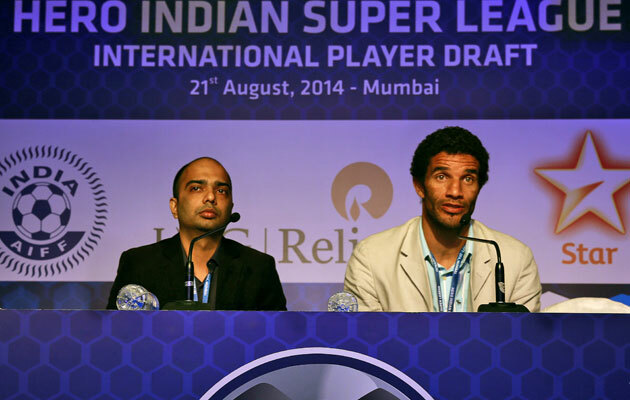 The second season of the Indian Super League (ISL) starts in early October. A high profile addition to the league is former Chelsea attacker Florent Malouda. The Frenchman has joined Delhi Dynamos who will be managed by former Real Madrid and Brazilian legend Roberto Carlos. With two separate leagues operating in the country there was a general consensus both the iLeague (11 teams) and ISL (8 teams) are likely to be merged.